What should I look for? | What Car? You'll want a car with a squeaky-clean service history so make sure all the stamps are present. 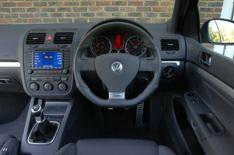 The Golf's steering can give problems, leading to a stiff steering wheel or creaking noises when turning. Dealers should sort these under warranty by replacing the steering rack. Wonky electrics are also a common complaint, with the engine ECU needing to be replaced. With any high-performance car crash damage is a real possibility, so inspect the car closely. Look out for: poor-quality paintwork with runs, ripples or blemishes; signs of misalignment, or anything that doesn't look like it came from the factory. The GTI has a habit of rapidly devouring its front tyres, while uneven wear is a sure sign of poorly aligned tracking.